Indoor basketball tournaments are great fundraisers for your school or indoor recreational facility, and it's even better when more participants and spectators show up than expected! Making sure that you have extra seating on hand for this type of situation is always a good idea! 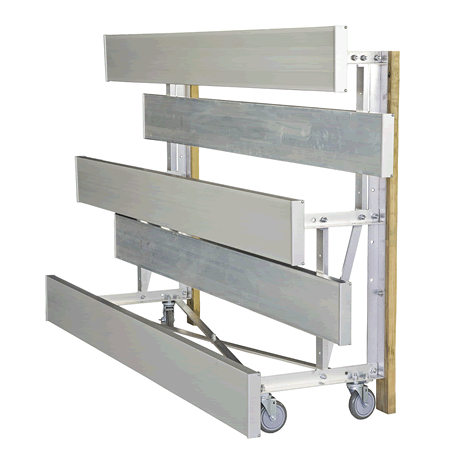 Tip-n-Roll bleachers are made to easily tip up on casters and roll through a door to your storage room. For most of the bleacher sizes, this is a one person job due to the special design of the caster system. For temporary, portable, indoor aluminum bleachers, these are what you need. Portable bleachers are perfect for your temporary seating needs and allow you to move from one event to the next with ease! These Tip N' Roll bleachers are easily tipped up onto swivel casters, or attached wheels, for movement while caster brakes keep the bleacher from rolling while in storage. They also have non-marring rubber foot pads that run the depth of the bleacher on either side of the frame which protect your hardwood floors when in use. Portable Tip N' Roll bleachers are constructed with an aluminum frame to reduce the weight, making for easier lifting. Casters aren’t made for all terrains so Tip N' Roll bleachers should only be used indoors. They require a capable adult to ensure that bleachers are moved safely, and larger units require more than one person to transport them. When ordering portable bleachers we advise you to check your local requirements for such things as aisles, guardrails, ADA, or other conditions. Check your local building codes before purchasing and request a Bleacher Safety Guide to ensure your seating is 100% safe. Call and let our friendly sales staff help you choose the perfect Tip N' Roll Portable Bleachers!